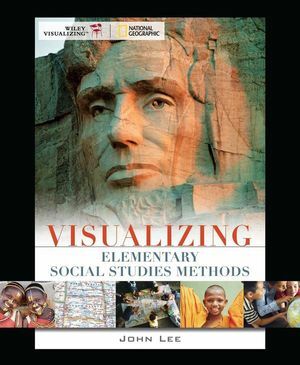 This debut edition of Visualizing Elementary Social Studies offers students a unique way to explore issues and ideas about how to teach social studies using text, pictures, and graphics brought together in a stimulating and thoughtful design. In this book, content and pedagogy are blended to take advantage of the rich visual context that National Geographic images provide. Students who use this book will explore central teacher education topics in elementary social studies along with concepts and ideas from social studies disciplines including history, geography, political science, economics and behavioral sciences. Visualizing Elementary Social Studies is infused with explorations of how to teach in subject matter contexts given the democratic purposes of social studies. This Wiley Visualizing title is a unique book that combines Wiley’s expertise in creating top quality textbooks with rich visual resources such as photographs, maps, illustrations, diagrammatic art, and videos, and the content and teaching expertise of new and current authors and unique partnerships. Visualizing Elementary Social Studies relies heavily on the integration of these visuals with text to elucidate concepts for students and solidify their understanding of them. The goal is to help students understand the world around them and interpret what they see in a meaningful, accurate and exciting way. The content, design and layout of the titles take advantage of the full capacity in which students process information – visual as well as verbal. Looking for a more cost-effective way to purchase this text? Check out www.wiley.com/college.wileyflex to learn more! Visualizing features: Multi-part visual spreads that focus on a key issue, concept, or topic in the chapter, exploring it in detail or in broader context using a combination of photos.